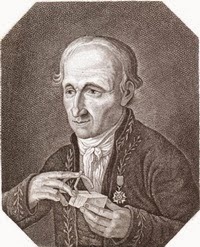 "It would be good if the readers, who wish to follow the details of these demonstrations, make themselves or have made, in cardboard or any other materials, solids that represent the principal varieties of crystals"
Haüy, 1784 - Portrait of French naturalist Haüy with contact goniometer, an instrument to measure the crystal angles. Haüy refused to use any other type of gioniometer during his lifetime, even if after 1809 high-accuracy optical goniometers, using reflection of light to measure the angles, were introduced. 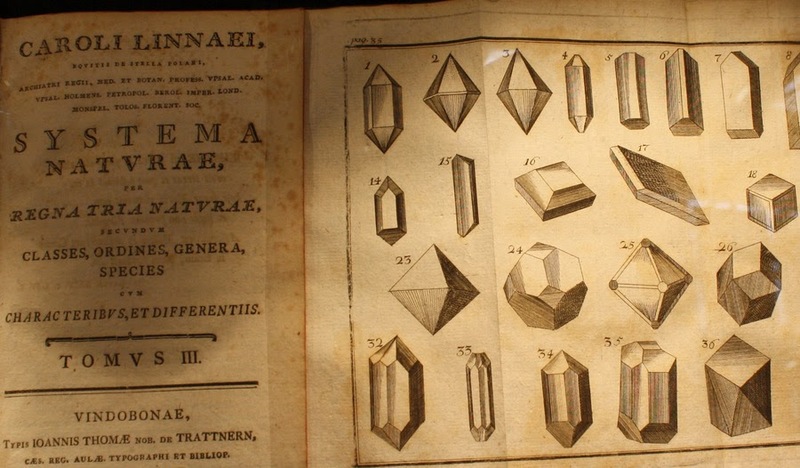 The Danish anatomist and naturalist Nicolas Steno (1638-1686) was the first to note in 1669 that the faces of a crystal (2014 was also dedicated to the science of crystals) are always arranged in specific angles and crystals display a characteristic symmetry. 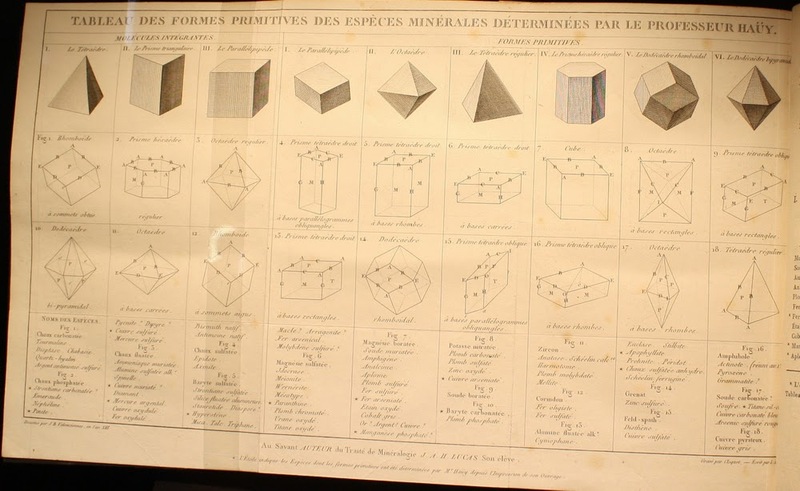 Mineralogist René-Just Haüy (1743-1822) used a mechanical or contact goniometer to accurate measure the angles between the faces, realizing that all the various shapes of crystals could be reduced to just a limited number of basic geometrical shapes. In 1784 he published his observations in the book" Eassai d´une théorie sur las structures des crystaux", introducing the idea of seven basic unit cells. From a single "forme primitive" (the first unit cell) by adding other unit cells a crystal could grow (this concept predates also the modern theory of crystal nucleation). Fig.1. Haüy´s seven unit cells, note the numbering, from "Eassai d´une théorie sur las structures des crystaux" (1784). Fig.2. & 3. 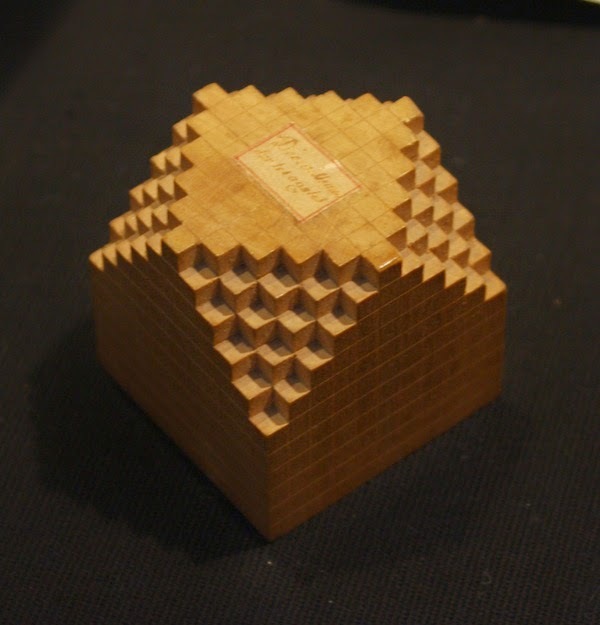 Wooden crystal model based on Haüy´s work, made in 1805 in Paris. 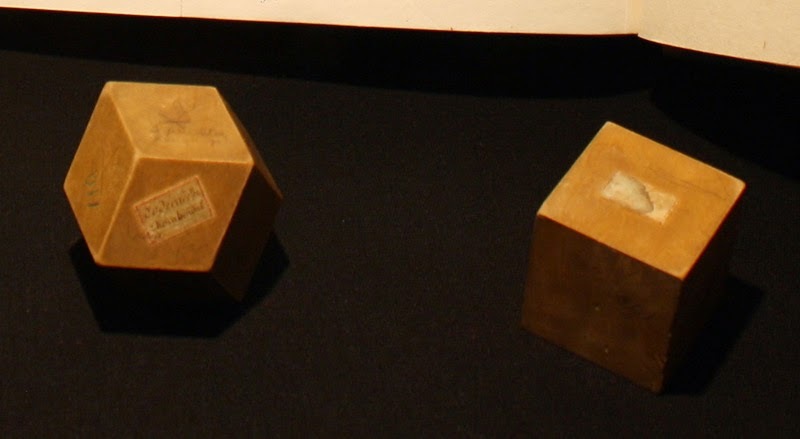 As certain symmetries are repeated in crystals of a mineral, Haüy concluded that a mineral is made up by smaller, basic chemical units - he called them "molecule intergrante" - symbolized here by the small cubes, forming both a larger cube as a rhombus (both characteristic shapes of the cubic crystal system). More than 500-1000 wooden models were made after 1801, some sets commissioned by Haüy himself. Most models show simple crystals with smooth faces, only 20 complex models, showing the structure with the unit cells, survive. Haüy´s work was quite influential for later mineral classification. 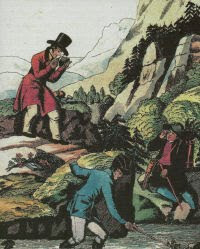 In his popular book "Über die oryktognostische Classification nebst Versuchen eines auf blossen äußeren Kennzeichen gegründeten Mineraliensystems" (The genetic-geological classification and an attempt to introduce a mineral-system based on superficial properties, published 1804) the German mineralogist Carl Friedrich Christian Mohs (1773-1839) combines various physical properties of minerals (like color, hardness and density) with crystal models to identify 183 different minerals. From there the use of simplified crystal geometry to identify minerals was quickly adopted by other naturalists and the classification of crystals based on the seven unit cells / crystal systems of Haüy is still in use today. Fig.4. Carl Linnaeus "Systema Naturae", published in 1770, in his work Linnaeus didn´t not only classify animals and plants, but also minerals. One element used to identify minerals were the various crystal shapes, here still displaying a confusing variability.